Premier Plastics Inc. warrants to the purchaser for use, that if any manufactured tank product is proven to be defective in material or workmanship within warranty term, and Premier Plastics Inc. is notified within 15 days after such defect is discovered, and a factory representative has the opportunity to inspect the tank or photographs of the tank in its operating location, Premier Plastics Inc. will (at company option) either supply a replacement part or repair said part. 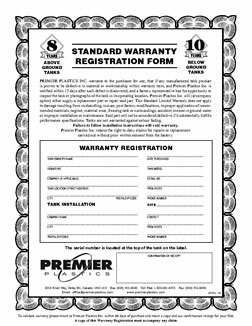 This Standard Limited Warranty does not apply to damage resulting from mishandling, misuse, post factory modifications, improper application of recommended materials, neglect, material wear, freezing tank or surroundings, accident, excessive ground water or improper installation or maintenance. Said part will not be considered defective if it substantially fulfills performance specifications. Tanks are not warranted against colour fading. Failure to follow instructions will void warranty. Premier Plastics Inc. retains the right to deny claims for repairs or replacement carried out without prior written consent from the factory.